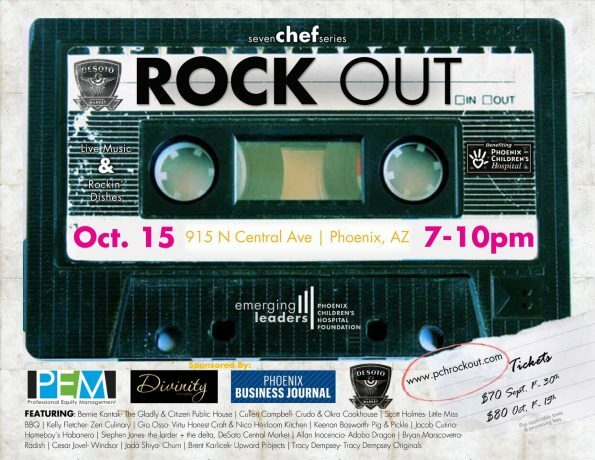 On Saturday, October 15 from 7-10 pm, Emerging Leaders, a select group of professionals dedicated to advancing the mission of Phoenix Children’s Hospital through community engagement and philanthropy and DeSoto Central Market will host Rock Out! – an 80’s rock-inspired food and drink festival to benefit Phoenix Children’s Hospital. An extended version of the Valley’s popular 7 Chef Series, Rock Out! will feature twelve local chefs with local wine, craft brews and cocktails, and appearances by DJ Mr. Phoenix and Sweet Cherry Pie, a local 80’s cover band. The 21 and over event will benefit Condition Critical, a campaign to build a new Emergency Department and Level 1 Pediatric Trauma Center at Phoenix Children’s. An “Encore After-party” will take place from 10 p.m. – midnight. Tickets are $80 and include all you can eat food, two drink tickets, plus one raffle ticket. For additional event details and to purchase tickets, visit www.pchrockout.com. Phoenix Children’s Hospital is Arizona’s only children’s hospital recognized by U.S. News & World Report’s Best Children’s Hospitals with rankings in all ten specialties. Phoenix Children’s provides world-class inpatient, outpatient, trauma, emergency and urgent care to children and families in Arizona and throughout the Southwest. As one of the largest children’s hospitals in the country, Phoenix Children’s provides care across more than 75 pediatric specialties. The Hospital is poised for continued growth in quality patient care, research and medical education. For more information about the hospital, visit http://www.phoenixchildrens.org. The 7 Chef Series started in 2014 when a group of local chefs including Bernie Kantak of Citizen Public House and The Gladly, Gio Osso of Virtu Honest Craft, and Josh Hebert of Posh came together to host a series of fundraising events throughout the Valley. The group was named the “7 Chef Series” for the fact that each event featured seven local chefs. The series will return on Saturday, October 15 at DeSoto Central Market with an 80’s Rock-themed, all-you-can-eat food festival, featuring an expanded roster of nine local chefs. Past events have included the 7 Chef Freak Out, 7 Chef Steak Out, the 7 Chef Veg Out, and the 7 Chef Pig Out.